Good grief, I had no idea! They are indeed the tallest corn plants I've ever seen... what do you do with them? Do they produce more ears per stalk than regular corn? Or giant ears? Amazing! Great job, by golly! Do you use tons of compost for the plants to get them that gi-normous! This could be a great boon for those of us with limited horizontal garden space. WOW....great Job...I believe the record is 31 feet? I won the Steele county fair ribbon for mine, it was the tallest at 11ft. 6 inches...a baby compared to these..
the variety was "Bloody Butcher" an old heirloom dent meal corn. A niche I've not seen before. How were you introduced to giant corn? Where did you acquire the seeds? Do you amend the soil? What do your neighbors think? Have a cup of tea and witness the evolution of an Organic Kitchen Garden. You GOTTA grow some of those in your garden, NatGreeneVeg! I can just picture the people staring. Time to get your garden design map out. I'm thinking I need some for my "waving to the neighbors" corn. applestar wrote: You GOTTA grow some of those in your garden, NatGreeneVeg! I can just picture the people staring. Time to get your garden design map out. What if you grew them in a circle and tied the tops into a giant tee-pee or a gazebo? sunflower_info, you've got our imaginations going! Sorry I don't have info to contribute, but I hope you'll stick around. applestar wrote: What if you grew them in a circle and tied the tops into a giant tee-pee or a gazebo? Would be an architectural feature for sure, but don't have a ladder that tall... and would be more dramatic if tied a the top than only as high as a human can reach. That is a 21 ft. tall aluminimum flag pole. I don't actually stake those plants with that. It's only to straighten out the plants for the pictures. Generally, I try not to use stakes. If I do, then it's a 8 ft. stake at the base to give to the plant extra strength at the base. I also tie plants together to give them extra strength. I was also tying them to rope from my second story windows. pharmerphil wrote: :shock: WOW....great Job...I believe the record is 31 feet? I started gardening in '98. My mom brought home a cleome in '97 and it grew over 6 feet tall. I was impressed with its growth; so I asked her if I could dig up some of her yard and plant some things. I bought a pack of sunflowers, dill, and cosmos from the hardware store. 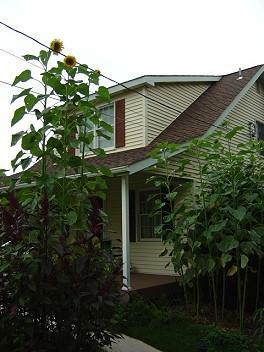 One of the sunflowers made it to 12 feet tall; so after that I was hooked. I then started growing corn a few years ago. My first corn plants were 15 feet. After corn, I started growth amaranth and then I had my first world record. I have been getting better and better at it each year. The secret to all of this is finding the best variety to grow. Most of my work is actually doing research. I constantly search for information on races of tropical maize or a newspaper article about some guy growing a giant sunflower. You don't have to be a great gardener, but just a good gardener to grow this stuff that big. As long as you have the right seed and just give them some basic care, they can grow over 20 feet. Olotillo-Tuxpeno - 22 feet 3 inches. I also did well with my giant amaranths this year. I still have some more to measure. That does it I'm growing corn next year for sure. Wow every thing you grow is tall. Jack in the corn stalk. How tall is that kid going to get?